The Middle has finally received some critical attention with a nomination at the 2019 Critics' Choice Awards. The Middle has been nominated in the Best Comedy Series category for its final season. The other nominees are Atlanta, Barry, The Good Place, The Kominsky Method, The Marvelous Mrs. Maisel, One Day at a Time, and Schitt's Creek. The winners will be announced Sunday, January 13 when the ceremony is broadcast live on The CW network at 7p.m. Eastern. A Sue-centric spin-off from The Middle is not going ahead, it was reported last week. ABC had ordered a pilot episode of a show which would follow Sue as she moved to Chicago to begin her career in the hotel industry. The Middle wrapped its nine year run on ABC earlier this year. Another cast member has been revealed for the Sue-centered The Middle spin-off currently in development, TVLine revealed today. Finesse Mitchell (Saturday Night Live) has joined the show as a series regular, playing a bartender in the Chicago hotel where Sue works. A number of casting developments have surfaced in the past week with Brock Ciarlelli returning as Brad, and Kimberley Crossman joining as a chef. A new actress has checked in to the potential The Middle spin-off focusing on Sue as she gets a job and moves to the big city. According to TVLine, the series would revolve around Sue as she works at a hotel in Chicago. In one of the last episodes of The Middle, "Bat Out of Heck", Sue successfully applied for a scholarship sponsored by a hotel chain. TVLine also reported that New Zealand actress Kimberley Crossman has joined the pilot as a hotel chef. Last week, it was revealed that Brock Ciarlelli, who played Sue's BFF Brad, had joined the project. Although the name of the show was reported as Sue Sue in the City, this is apparently still only a tenative title. ABC has ordered a pilot of the show but has not yet ordered it to series. The Middle's potential spin-off focusing on Sue has at last been given a title, according to The Hollywood Reporter, just as a familiar face is added to the cast. Noting the titular character's tautologous name and her move to Chicago, the show is titled Sue Sue in the City. Brock Ciarlelli, who played Sue's best-friend Brad Bottig in 56 episodes of The Middle, has joined the cast as a series regular. ABC has ordered a pilot and if the spin-off were to be ordered to series, it could make ABC's line-up as early as mid-season. Just over a week since The Middle wrapped its nine-season run on ABC, a spin-off show starring Eden Sher is said to be in the works at the network. The network is reportedly close to giving a pilot order for the show from The Middle creators DeAnn Heline and Eileen Heisler, though there is no guarantee a show will make it to air. The Middle's hour-long season finale glimpsed at what the future holds for Sue Sue Heck, though it's not clear where exactly this spin-off would find Sue. This late in the development cycle the show would not be ready for the fall line-up, but could be feature of ABC's mid-season line-up. Alternatively, the network might choose to hold the show for the 2019/20 season. If ABC does order this Sue Sue spin-off, it will be the network's third sitcom to spawn a sequel with a black-ish offshoot on Freeform and a Goldbergs slated for the network's mid-season schedule. ABC's comedy slate has seen a significant change in the past twenty-four hours as the network swiftly cancelled Roseanne, which returned this season after twenty-years to breakout ratings, after its titular star delivered another racist tirade on Twitter. Earlier this year, Roseanne took The Middle's time slot for its now altogether brief return, leaving open the possibility that Sue Heck might find her way back to Tuesdays at 8/7c. 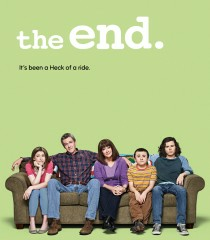 ABC has issued the press release for the upcoming hour-long series finale of The Middle. The show will bow out with "A Heck of a Ride: Part One" and "A Heck of a Ride: Part Two" on Tuesday, May 22 from 8/7c. “A Heck of a Ride: Part One/A Heck of a Ride: Part Two” – After nine hilarious and heartfelt seasons, a Heck leaves the nest as the family takes a road trip to Denver, where Axl will start his new job – and new life away from home, on the one-hour series finale of “The Middle,” TUESDAY, MAY 22 (8:30-9:30 p.m. EDT), on The ABC Television Network, streaming and on demand. ABC has issued the press release for the penultimate episode before The Middle's hour-long series finale. "Split Decision" airs Tuesday, May 15. Split Decision – Now that Frankie knows Axl was offered a job in Denver, she makes it her mission to sway him from taking it and moving away. Meanwhile, the usually overly optimistic Sue is depressed over Sean leaving for Ghana, without ever expressing her feelings for him; and Brick drives everyone crazy when he buys a huge amount of lawn chairs to replace the one he’s been using for nine years, on “The Middle,” TUESDAY, MAY 15 (8:30-9:00 p.m. EDT), on The ABC Television Network, streaming and on demand. ABC has issued the press release for the May 8 episode of The Middle, "The Royal Flush". The Royal Flush - In an attempt to get Frankie the best Mother's Day gift ever, Sue and Brick enter a trivia contest where they could win a trip for two to London for the upcoming royal wedding; and Axl is offered a job interview that could change his life, on "The Middle," TUESDAY, MAY 8 (8:30-9:00 p.m. EDT), on The ABC Television Network, streaming and on demand. The Middle's final season is taking a break this Tuesday, April 24, but will continue next week with "Great Heckspectations". 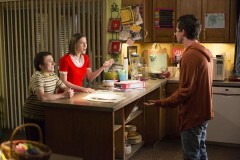 ABC has announced the next episode of The Middle, "Great Heckspectations", which airs Tuesday, May 1. Great Heckspectations – Frankie has to force Brick into asking Cindy to the high school prom but worries that his quirkiness could spoil the happy event; Lexie talks a clueless Axl into giving Sue a belated 21st birthday present; and Mike becomes frustrated over how to get used to a new TV remote, on “The Middle,” TUESDAY, MAY 1 (8:30-9:00 p.m. EDT), on The ABC Television Network, streaming and on demand.